First unveiled in 1966 as part of the Greater London Council's new "London Motorway Box" proposal, the North Cross Route was to form the northern flank of London's innermost motorway ring road. The GLC considered it one of the most urgently required new roads and it progressed further through the planning process than most of their other road proposals. In August 1966, the consultants Travers-Morgan published the North Cross Route Engineering Report, which set out firm proposals for the motorway — a route, a design specification, junction layouts and a full set of engineering plans. This means that (quite unusually) we have a very clear picture of how the North Cross Route was meant to look. The road itself would have had four lanes in each direction, with hard shoulders on both sides of both carriageways, and extra parallel carriageways running alongside in some places. Parts would have been elevated and others sunk below ground level, and in more than one place its connections to surrounding roads called for junctions with multiple flyovers stacked above one another and double-deck viaducts. The motorway would have sliced through Harlesden, Kilburn, West Hampstead, Camden Town, Islington, Dalston and Hackney. A motorway through these places would be unthinkable today, but most of the areas affected by the North Cross Route were relatively deprived in the 1960s, and few were as popular or wealthy as they are today. It was never going to be easy, however, to drive a motorway through Hampstead or Belsize Park. The plan would have ruined the leafy, wealthy character of the area by carving a cut-and-cover tunnel through it. This would also have involved the demolition of Sigmund Freud's house on Maresfield Gardens (now the Freud Museum). An alternative proposal, avoiding Belsize Park by boring four two-lane tunnels, was rejected on grounds of cost. This description begins at the western end of the route and travels east. The North Cross Route was to begin at Harlesden, at a large free-flowing interchange built on derelict railway land immediately south-east of Willesden Junction station. It connected four separate roads — the West Cross Route heading south; the North Cross Route heading east; a link to the A40 heading west and a "link to Harlesden" to the north. The latter was a grade-separated link road running parallel to the railway to connect with the A406 North Circular Road at Stonebridge Park (which would, of course, have been part of Ringway 2). At Willesden Junction, access would have also been provided to and from Harrow Road. Heading east, the motorway would run along the north side of the North London Line in cutting, passing under all the existing streets. After crossing the A5 Kilburn High Road and the railway viaduct carrying what are now the Chiltern, Metropolitan and Jubilee Lines, there would be the first major junction, a free-flowing interchange where the M1 was to terminate. Since this little patch of residential land was almost hemmed in by railways and roads anyway, it was considered that this was the least obtrusive place for the junction. From the M1 junction until Finchley Road, there would have been an extra carriageway on each side of the road to cater for the large volume of traffic that would be using the North Cross Route to hop along one junction to move between the M1 and A41 Finchley Road. The motorway would then continue, now with six lanes each way, plus additional hard shoulders, barriers and verges, alongside the North London Line until West End Lane, where it would pass under both the railway and the road. At Finchley Road, there would be a roundabout beneath the motorway, with extra slip roads between the west and south to serve the large turning movement at this junction. The location of the junction would be about where the "O2 Centre" now is, near to Finchley Road station. Very soon after the junction, the motorway would enter a cut-and-cover tunnel through Belsize Park where the ground rises. The diagram below shows how planners envisaged new buildings being constructed on the roof of the tunnel to close the gap that would be created during construction. It would emerge at Eton Avenue, and cross Adelaide Road. Bus bays would be provided at the now-closed Primrose Hill station, and the motorway would be elevated over what was then the Camden Goods Yard, owned by British Rail, now redeveloped and home to a large supermarket. BR were not very happy about having a motorway — even on stilts — running over their goods yard, and so an alternative route, slightly further to the north, was proposed in case this was rejected. On plans the only surviving building sandwiched between these two alternative lines is the Camden Roundhouse. There would be a junction with the proposed Camden Town Bypass close to Chalk Farm Road. This would be a very expensive interchange to construct, due to the tight space involved: the site would be heavily constrained by the various railways, the goods yard, and the Regent's Canal. 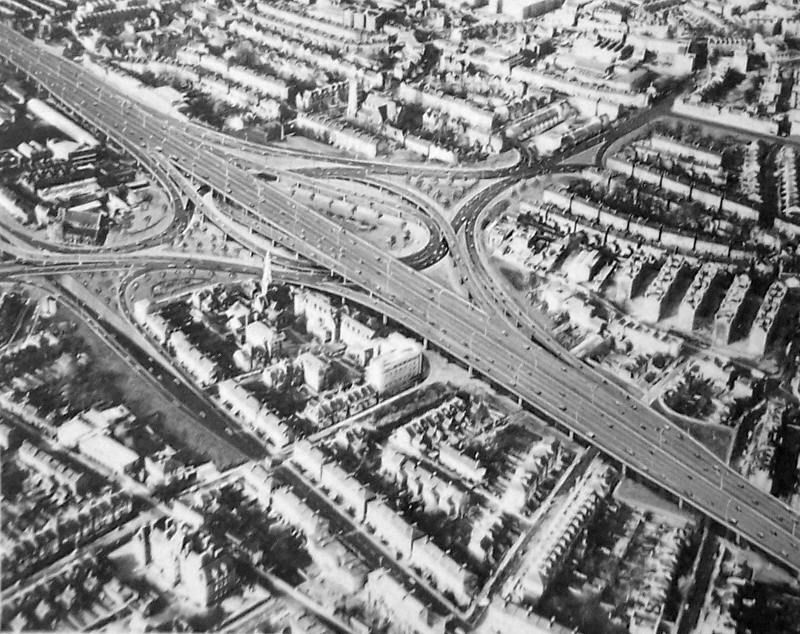 The resulting free-flowing interchange would have employed a double-deck viaduct, carrying the Camden Town Bypass over local roads, and the North Cross Route above that. All traffic on Ringway 1 would be able to access the Bypass heading in towards London, and vice versa, but the northern arm of the Bypass heading away up Camden Road would only have been accessible to traffic coming to and from the west. Local access roads at this point were to connect only to the Bypass. The diagram below shows the connections planned at the interchange, but not the layout: a plan diagram is difficult to follow because of the double-deck arrangement. It also omits the proposed bus bays at this location, which add an extra layer of complexity, and which the GLC were unlikely to build. The motorway would pass over Camden Lock alongside the railway, casting a shadow over what is now a fashionable market area. East of Camden, the motorway would rejoin the North London Line railway, with the next interchange close to the crossing of the East Coast Main Line. The consultants' plans included a design for a free-flow interchange at this point if the "Proposed North London Radial" was built. 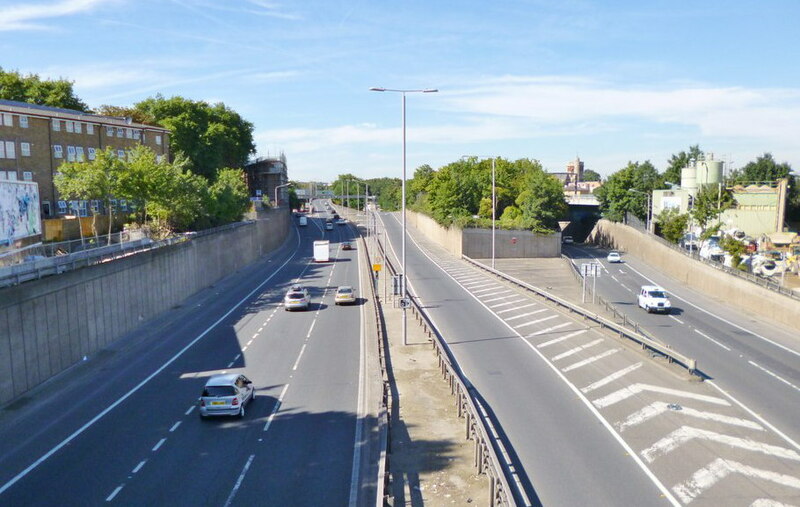 The motorway would cross the North London Line near Highbury Corner (A1), running in a cutting below the square on the south side of the railway line. Rising above ground level, a complex interchange was to be provided at Dalston on the A10, either with a compact set of sliproads joining a gyratory system formed from existing streets, or with a large free-flow interchange connecting to other upgraded roads in the vicinity. The route then continued on the North London Line railway to approach the East Cross Route at Hackney Wick. The extended M11 would connect at this junction, along with an extended Eastern Avenue. The North Cross Route has its origins in 1950s motorway planning, conducted largely behind closed doors, by the London County Council. Unable to pursue the A-Ring, they found a potential route for a motorway on the north side of Central London further out, following the North London Line railway. Initially their proposals followed the North London Line very closely, with a big detour between Finchley Road and Camden Town where it followed the railway tunnels up to Gospel Oak and then south again. That had been ironed out by 1965, but the pitfall of the more direct route was that it introduced a controversial new section through Belsize Park — not following any existing line of severance through the urban area and instead requiring demolition of wealthy houses for the building of a tunnel just under the surface. The GLC did investigate building a bored tunnel for this section, to avoid the demolition and the backlash, but decided against it. In the glossy leaflet they published to introduce the new road to the public in 1965, they wrote that "to accommodate eight lines of traffic it would be necessary to construct four separate tunnels; these would involve very wide approach areas and improved connections with the secondary roads, which taken together would lead to greater property and environmental disturbance and the displacement of considerably more people than would be affected by the 'cut and cover' method proposed". They estimated that £40m could be saved by ruling out bored tunnels (that being at 1965 prices; by 1972 the cost would have risen considerably). Travers Morgan changed the design of the road's junctions considerably once they were handed the brief to design it and made one particularly odd amendment. The LCC and GLC's own designs for the junction at the west end of the motorway, at Willesden, had the main line of the North Cross Route turning the corner to flow directly into the West Cross Route. The final version of the plan, produced by Travers Morgan, had a set of sliproads to perform that turn, with the main line of the motorway sent west instead to meet the A40 Western Avenue. The North Cross Route was hugely unpopular from the very beginning and was among the first roads to face protests from Borough Councils. The Borough of Hackney led the charge. They were deeply unhappy about the plan to build the North Cross Route in two stages, the first one being from Hackney Wick to Dalston, temporarily terminating the eight-lane motorway on the A10 Kingsland High Street. They said that, if the road had to be built, then it should open from Hackney to Finchley Road as one single section. But even then they had serious misgivings about whether even the finished motorway would do anything to relieve traffic in their borough. At the GLDP Inquiry, they objected on the basis that there was no evidence that it would improve the situation on Hackney's roads. Curiously, once the GLDP Inquiry had concluded and the Layfield Report had been published, the North Cross Route was not immediately struck out. There was uncertainty for a time over whether the North Cross Route or the North Circular ought to be the innermost motorway route north of Central London. It remained a distant possibility until the Labour Party swept to victory in the 1973 GLC elections and consigned it, and all the other remaining motorway plans, to the bin. As the closest motorway to central London, Ringway 1 would have served as the terminus for most of London's radial motorways. On the North Cross Route, as well as the terminus of the M1, several of the interchanges with the local road network had potential to be upgraded further to incorporate a motorway connection. In the earliest drafts of the motorway, produced by the London County Council (LCC) in the early 1960s, the A10 motorway would have ended up on the North Cross Route at a new junction just east of Dalston. An alternative routing of the M11, running some miles west of its current line to follow the Lea Valley instead of the River Roding, could also have finished on the North Cross Route nearby. By the time Travers Morgan had their hands on the proposals, and were drawing up their consultant's report showing the final version of the route (which is the version described in detail above), both those proposals had been dropped. But others took their place. East of Camden, near the Caledonian Road, they produced designs for a free-flowing junction that would serve either the Proposed North London Radial, or the King's Cross Radial, or both — motorways running north to the outer reaches of the suburbs and south to the Pentonville Road. Space was also made to accommodate an alternative line for the Eastern Avenue Extension, a major road that would carry traffic inwards from Hackney Wick to Angel. The main line of that route would have run parallel to part of the North Cross Route, along the edge of Victoria Park, but an alternative proposal avoided having two parallel motorways and the destruction of the park by bringing the Eastern Avenue route northwards to reach the North Cross Route at Dalston. Late in 1967, the Daily Express ran an article taking delight in the fact that Barbara Castle, then Minister for Transport, and her husband had just bought a new flat in John Spencer Square, Canonbury, which was directly overlooking the line of the North Cross Route. Mrs. Castle's Ministry will transform the vista from the sitting-room window into a noisy, bustling panorama of earth movers, cranes, bulldozers, pneumatic drills and cement lorries. This proposed highway scheme was all news to Mr. Castle. It turns out, of course, that the story is not quite as juicy as it might seem. A memo following up from the story, from a Christopher Hall at the Ministry of Transport, notes that the block of flats were new, and had been designed by Sir Basil Spence with the future motorway in mind. In fact, the strangest thing about the story is the quote attributed to Mr Castle. He was, at this time, Vice-Chairman of the Greater London Council's Highways and Traffic Committee, which was entirely responsible for the planning of the North Cross Route. Perhaps he hadn't been paying much attention at the meetings, but it's perhaps more likely that the Express had saved him the trouble of providing a quote by writing one of their own. It would be easy to say that none of the North Cross Route was ever built, and that's very nearly true. But when works were in progress on the East Cross Route, construction of the interchange at Hackney Wick included a tiny bit of road that was intended, one day, to form part of the North Cross Route. That means that a full 221m (241 yards) of the eastbound carriageway does exist. Not only was this little stub of North Cross Route built, but you can drive it too, if you wish. The southbound entrance to the East Cross Route from the A106 goes up a steep ramp (which was designed to be temporary, but which is now a permanent feature) and then runs along a straight, flat section of road before merging in with the main flow of traffic. The temporary ramp is quite narrow, as an entrance from a minor road ought to be, but at the top it widens out quite suddenly. Lots of white paint is used to restrict the available road space to just one lane, but the actual paved width of this sliproad is clearly big enough for two full motorway lanes and a hard shoulder. The sliproad then forms an extremely unusual right-hand entry to the East Cross Route, which indicates that it was supposed to be the main through-route at the junction. So, if you find yourself in Hackney with nothing much to do, you could drive the entire North Cross Route. The speed limit is 40mph, which means it should only take 12.35 seconds. Artist's impressions of M1 interchange and Belsize Park tunnel are from "New Roads in West and North Central London", GLC, 1965. Artist's impression of interchange at Dalston is from "North Cross Route: York Way to Hackney Wick, Investigation of alternative alignments", GLC, January 1967. LCC draft plan extracted from MT 106/195. Eastern Avenue Extension interchange at Dalston extracted from HLG 145/62. Photograph of Hackney Wick interchange adapted from an original by Mike Faherty and used under this Creative Commons licence. The original text on the North Cross Route, from which the earliest versions of this page has been adapted, was written by Tom Sutch.